A local lad from the Moulamein and Wakool area ‘Rusty’ turned up on most days at Barham for school until 1996 where they thought that he had better leave and try to learn a trick or two at Yanco Agricultural College. There is no doubt that he did learn a ‘trick or two’….but he remains eternally quiet on the details…and then he started out on his journey into agriculture and employment. From being a Jackeroo and property overseer around Hay to a twelve month stint in America driving headers, trucks…and barmen crazy…and back again to the family farm, Rusty has seen a bit of the world of farming and livestock. Rusty started with BR&C in Swan Hill in 2012 and is now based in Barham to support his own local clients. Played a bit of Union for the Yanco Phantoms and footy for Wakool and Moulamein over the years…he now gallops around a field whacking a ball with a polo stick. 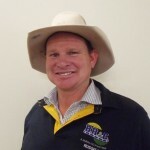 When really pressed…Russell says that he prides himself on being good with people, having a great linkage and knowledge with the local region’s families and history and being able to gauge livestock accurately for the client.